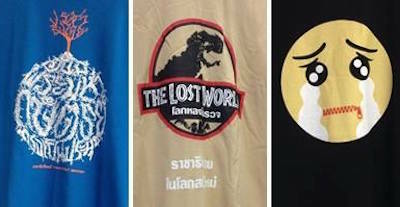 Military and police officers have prevented the sale of three t-shirt designs at the National Book Fair in Bangkok. The t-shirts were being sold at the Same Sky journal's booth at Queen Sirikit National Convention Center, though Same Sky editor Thanapol Eawsakul was told to withdraw them from sale. One of the shirts depicts a tree whose branches form the Thai words 'absolute monarchy' and whose extensive roots form the Thai words 'constitutional monarchy'. 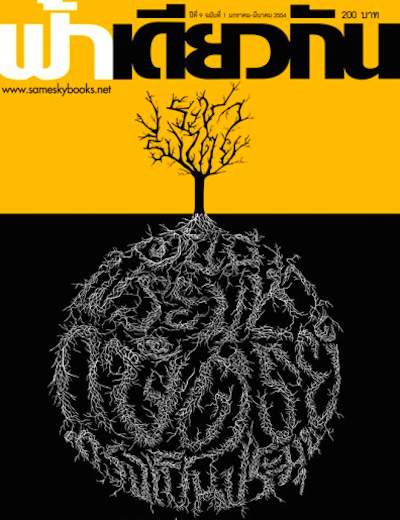 This design was previously used as the cover illustration for an issue of Same Sky (volume 9, number 1; 2011), and that issue was also notable as it included Thai translations of some WikiLeaks cables relating to Crown Prince Vajiralongkorn. Same Sky has faced several previous legal problems. Thanapol was detained by the military, following the coup earlier this year. Same Sky was banned in 2005 due to its interview with Sulak Sivaraksa, though the interview was later reprinted. The journal distributed VCDs of the 'Tak Bai incident' in 2004, although Prime Minister Thaksin Shinawatra declared that the VCDs were illegal. 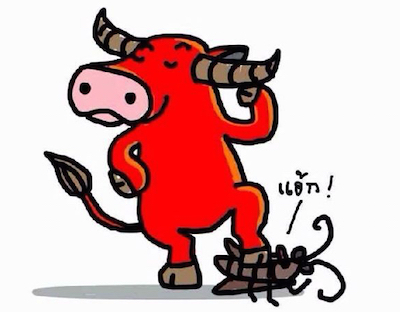 On 19th November 2010, following continued unrest after the 2010 military massacre, Prayuth Chan-ocha (the current Prime Minister) issued an order banning any merchandise that might cause political conflict. 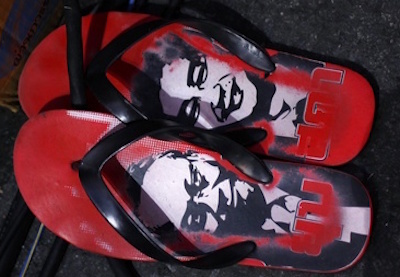 As a result, several vendors were arrested for selling flip-flops bearing images of Prime Minister Abhisit Vejjajiva. Abhisit himself had not been not consulted on the order, and he publicly criticised it; Prayuth rescinded it a week later.